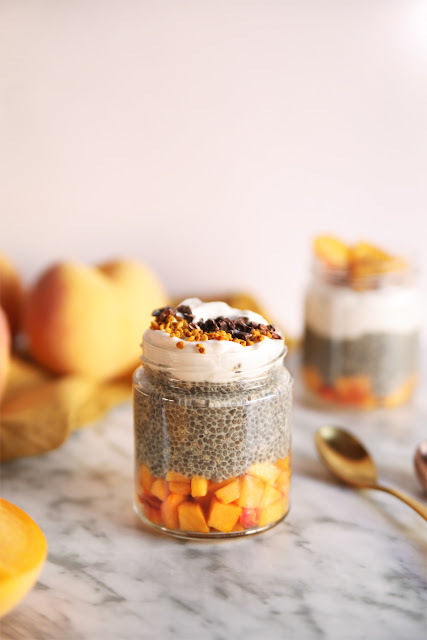 This week I'm bringing an amazingly delicious recipe to make up for my absence, it's one of those recipes that go straight to your 'top 5' right after the first bite. These two last weeks I've been more than busy preparing four recipes for a spanish food company I collaborate with but luckily I managed to make a few things for my blog too. 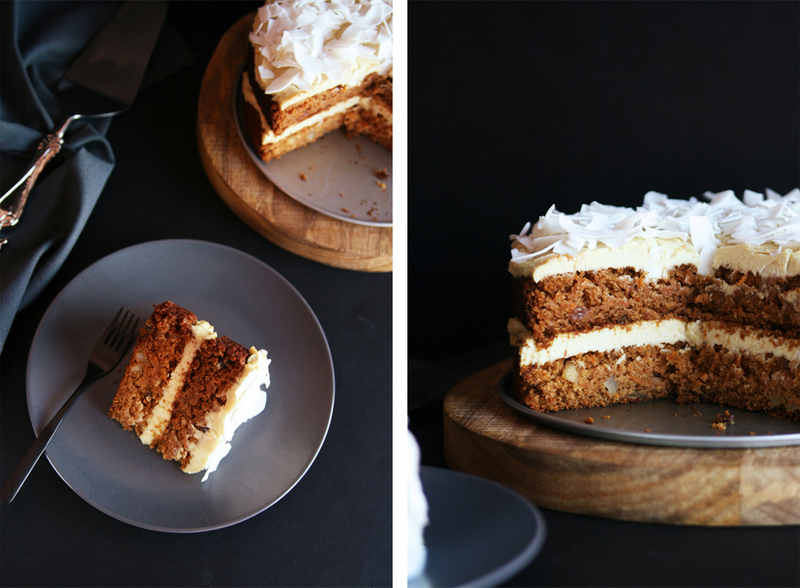 When I said this vegan carrot cake is amazingly delicious I wasn't exaggerating, not at all! 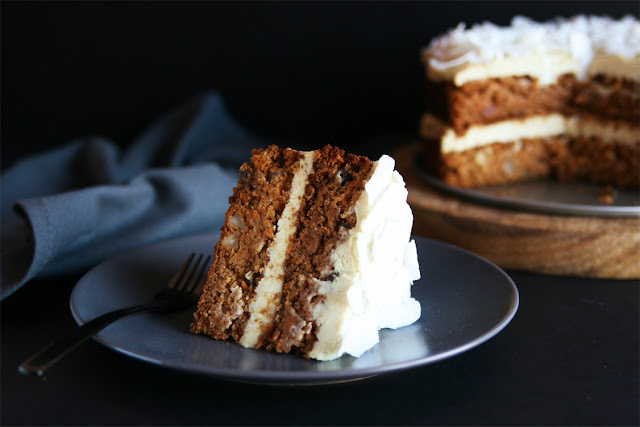 I'm a sucker for carrot cake and my taste buds are well trained when it comes to detect what makes a carrot cake a really good one. You will have to try this recipe though to believe me, I mean...how many food bloggers tend to say "this is my best recipe ever, omg you have to try it! "; we all have done it before, it's normal cause you get super excited when a recipe comes out great but there will always be that person that goes "hmm, I don't see what all the fuss was about", ha, KO! Well, well I must say the cake recipe was adapted from one of my absolute favorite vegan chefs, Fran Costigan aka the Queen of Vegan Desserts. Every time I want to prepare a special cake for a celebration with zero risks of failing I don't hesitate, Fran to the rescue! 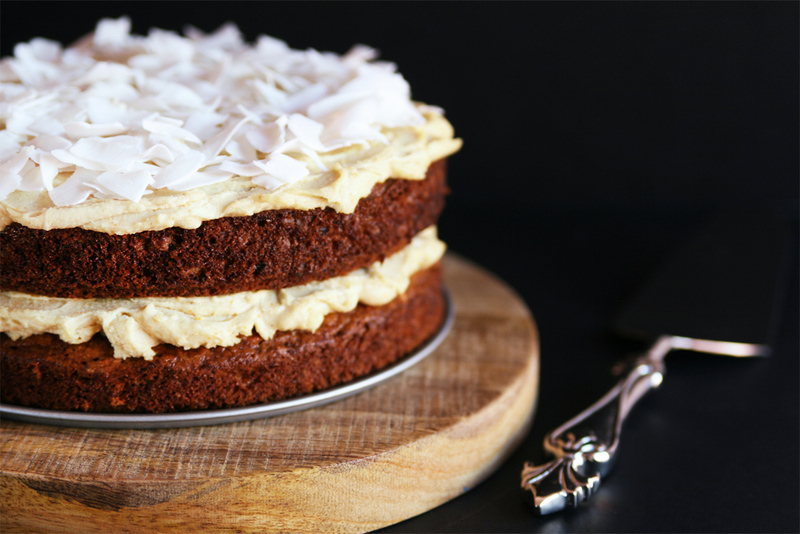 Her cookbooks are always a safe bet so those who know her will already be convinced about this cake's level of yuminess. Also, I think the pictures speak for themselves, don't you think? 1/3 cup freshly squeezed orange juice. 1/4 cup mild-tasting extra virgin olive oil, such as Arbequina. 1/2 cup plain soy or almond milk. 2 cups shredded carrots, firmly packed. 1/4 cup pecan nuts, chopped. 1 1/3 cups raw cashews, soaked overnight. A couple drops of both lemon and orange essential oils. 3 tablespoons cacao butter, melted. *Carrot cake recipe adapted from Fran Costigan's 'More Great Good Dairy-Free Desserts Naturally'. · Day one: soak the cashews overnight. To speed up the process you can soak them in hot water for one hour approximately. 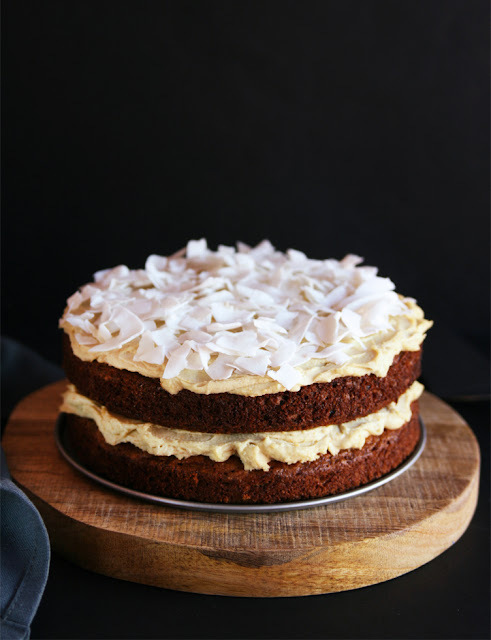 · Day two: make the cashew buttercream frosting and let it set overnight in the fridge. Also the same day, bake the cake and chill the layers in the fridge overnight. · Day three: assemble the cake. 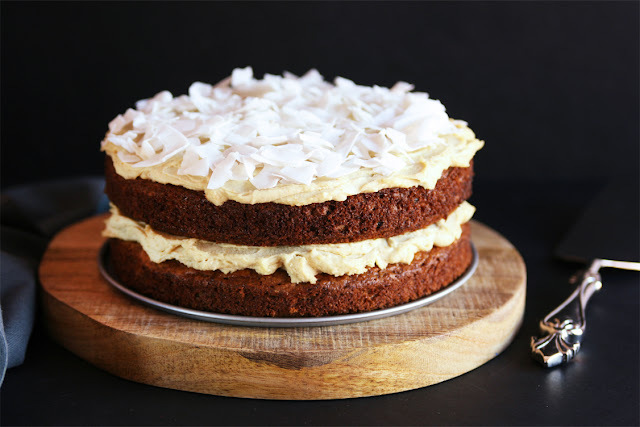 Fill and frost the cake, refrigerate a bit before slicing and decorate with the coconut. Soak the cashews in 2 cups of purified water overnight. Rinse well and place the cashews into your blender or food processor with the almond milk. Blend really well until you get a smooth cream with no lumps, you might need to stop and scrape down the sides of the blender jug a few times. Add in the agave syrup, vanilla, lemon juice, salt and essential oils. Blend again until completely combined and gradually pour in the melted coconut oil. The buttercream should look smooth and creamy. Transfer to an airtight container, cover the surface with plastic wrap, put the lid on and refrigerate overnight to let the cream set, it will thicken considerably once chilled. Preheat the oven to 170 ºC (350 ºF) and lightly grease with nonstick cooking spray two 20 cm/8-inch round cake pans, line the bottoms with parchment paper. Soak the raisins in the orange juice for 10 minutes or until they are plump. Drain but reserve the juice for later. Grate the carrots and transfer them to a strainer to squeeze out the excess liquid, this is really important if you don't want to get an excessively moist cake that won't rise well. In a medium mixing bowl sift the flours, baking powder, baking soda, spices and salt. Stir with a wire whisk to distribute the ingredients. In a separate medium bowl, whisk the oil, maple syrup, milk, vinegar and 2 tablespoons of the reserved orange juice, until well blended. Pour the wet mixture into the dry mixture and stir with a whisk until the batter is smooth. 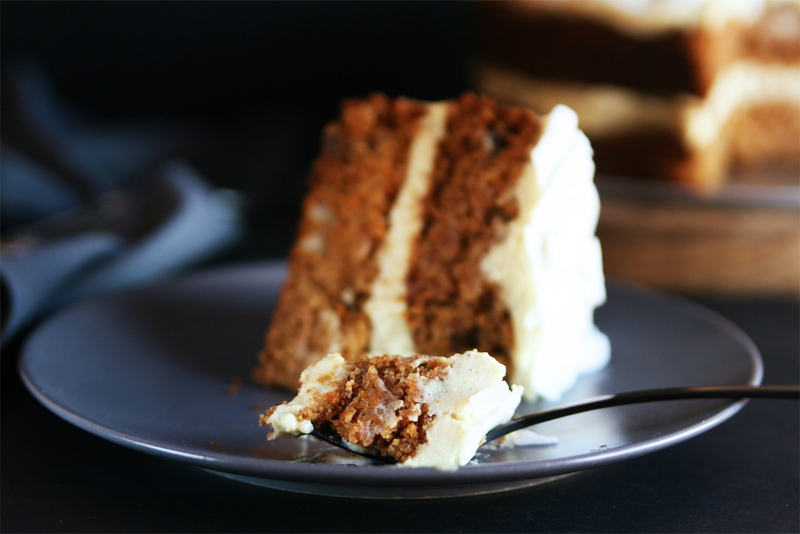 Fold in the grated carrots, raisins and pecan nuts with a silicone spatula. Divide the batter evenly between the two pans and bake for 30 to 35 minutes, until golden and a toothpick inserted into the center of each cake comes out clean. Cool the pans on wire racks for 10 minutes, remove from the pan and carefully peel off the parchment paper. Let the cakes cool completely top side up. Wrap each one with plastic wrap and refrigerate overnight before fillin and frosting. Let the cashew buttercream thaw a little bit at room temperature before spreading cause it will be quite thick after being refrigerated. 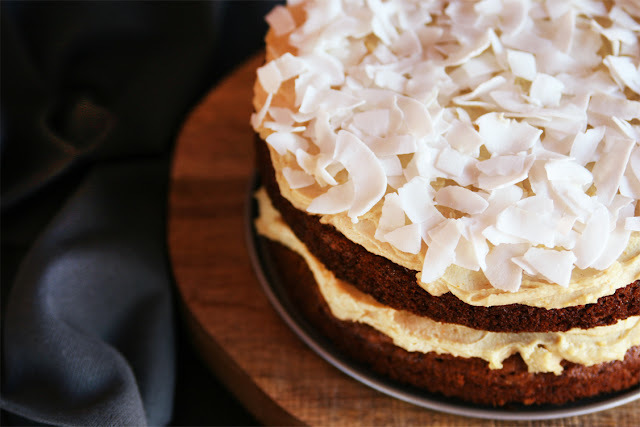 Place one layer on a flat plate and generously spread with half of the cashew buttercream frosting. Cover with the second layer of cake and repeat with the remaining buttercream. 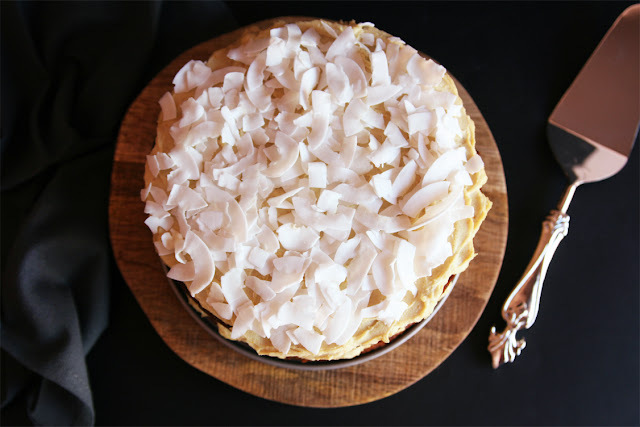 Refrigerate for a few minutes and finally top with the coconut flakes.